When You Call A Locksmith, Will A Con Man Answer? People needing a locksmith sometimes find their calls answered by an out-of-state phone bank — which then sends a swindler out on the service call. The con men are listed in the phone book and online — and that's a problem for genuine locksmiths. When You Call A Locksmith, Will A Con Man Answer? The Real Deal: Locksmiths are trying to find ways to warn the public against scam artists. 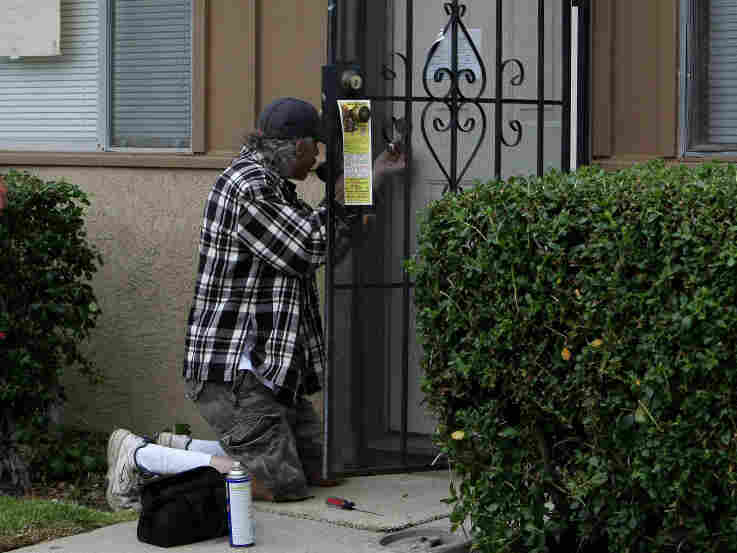 In this file photo, a locksmith picks the lock of a foreclosed home in California. Hard economic times often give rise to swindlers — people hoping to make a quick buck by misleading hapless consumers. It's not easy to catch these con men, who often go door to door. But there's one scam out there that has mobilized an army of angry people. The scam has locksmiths up in arms. Bill Roberts has been a locksmith serving small cities in central Virginia for seven years. Out on a recent service call, he said he has a good, steady business — "if you don't mind working long hours and being on call seven days a week, 24 hours a day." "It makes it a little hard on family life at times," he says, "but, yes, it's not a bad business to get into." But 100 miles to the north, in a suburb of Washington, D.C., locksmith Mark Baldino is worried. From his office, he does a computer search for locksmiths in Reston, Va. Pointing to the results, he says, " 'B' is our red dot, but within a half-mile, you see one, two, three, four, five other locksmiths. And if you scan out on the map a little bit further, you'll see about 10 locations, maybe 20." The problem is that few of those listings are legitimate locksmiths. Most ring to an out-of-state call bank that quotes a low rate — then dispatches a con man who is not trained to pick locks. Joanne Grimes, a retired teacher who owns rental property in Alexandria, Va., says her tenants were told a service call would cost $185, but the bill came to $586. "You know, I can go to Home Depot and buy a lock and a door for $600," she says. Grimes contacted the Better Business Bureau, where president Edward Johnson has been trying for five years to get something done about phony locksmiths. "One of the larger ones that the BBB has identified is a company that poses as a local locksmith in cities across the country. And indeed, they advertise in the Yellow Pages using local phone numbers and fake local addresses," Johnson says. "A consumer might think they're dealing with a local locksmith, but the phone call is actually routed to a call center located in the Bronx of New York City." But stopping these scammers has been difficult. In Richmond, Va., locksmith Jeff Musser, who founded a company called 1-800-UNLOCKS, says consumers rarely dispute the bill. "They've got a kid to pick up from school. Their husband is at work. They've got to get that key made," he says. "When they give a credit card, sky's the limit with the credit card." And his partner, Barry Wilson, says some victims are afraid to complain. He recently got a call from a woman who said she was overcharged and left with a broken lock. "Her door lock was drilled open, and she was pretty petrified," Wilson says. "I tried to get her to talk to the investigator with the department of criminal justice, and she just wouldn't. She just said, 'Please come and fix it, and I'll pay you whatever.' "
Asked if the scammers got any money from the woman, Wilson says, "Oh, yeah. He made her get it out of the debit machine that night." In response to this situation, locksmiths have been joining a Texas-based trade group — the Associated Locksmiths of America. Their dues help pay for a series of public service announcements — something attorneys general have also tried. In one such spot, Macie Pridgen of the Virginia Beach Commonwealth Attorney's Office warns the public "to beware of untrustworthy locksmith companies who are ripping off consumers across the country." The message urges customers to be cautious, noting that most of the locksmiths use an unmarked vehicle and only accept cash. The locksmiths' group has also hired a lobbyist to promote stricter laws. Fifteen states now regulate locksmiths, and a few have taken con artists to court. The locksmith scam has even caught the attention of the FBI — but so far, the bureau says it's not dangerous or costly enough to warrant a national investigation.